Swarthmore College students stage a sit-in at the office of President Valerie Smith, demanding the administration divestment from fossil fuel stocks held in its endowment. 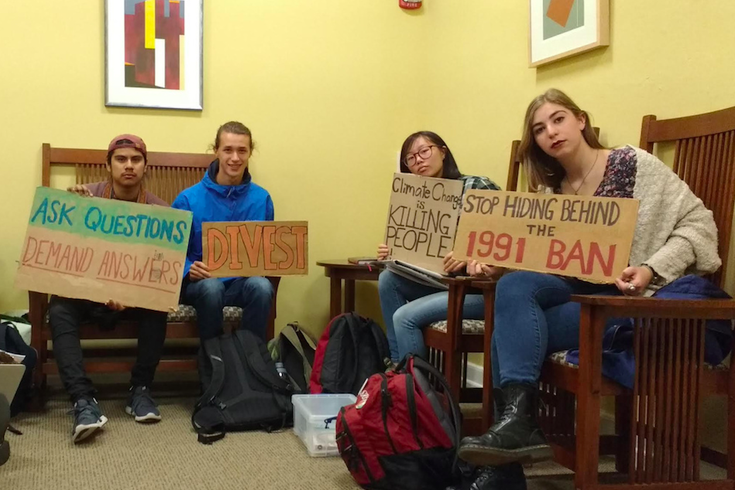 More than 30 Swarthmore College students staged a sit-in Monday morning to demand that the Delaware County school divest of the fossil fuel stocks it holds in its endowment. The school's Mountain Justice group staged a sit-in at 9:15 a.m. at the office of college president Valerie Smith, entering Parrish Hall with an array of signs decrying the effects of climate change. The number of protesters has fluctuated since the start of the sit-in, but Mountain Justice coordinator William Marchese says the group has no intention of leaving — even after business hours close. "We're not leaving at 4:30 (p.m.)," Marchese said. "There's going to be a lot of students that are going to be sitting with us then." The protesters plan to demonstrate throughout the week. The Mountain Justice group has been urging school officials to divest of its fossil fuel holdings for years, to no avail. Students staged a 32-day sit-in two years ago, but the school's board of managers voted against divestment. The college released a statement Monday afternoon that affirmed the students' right to protest. It said the college is committed to addressing climate change but not divestment. "Swarthmore College affirms the rights of our students to engage in peaceful demonstration and freedom of speech, as long as those rights do not interfere with the rights of others," the statement read. "We agree on the critical need to address climate change on our planet. We are committed to finding the most effective ways to become more sustainable ourselves, and to urge other institutions of higher education to do the same." The Mountain Justice group held a similar demonstration in February, assembling in the school's finance and investment office. Five students later received notices of potential disciplinary action because they entered the personal office of Chief Investment Officer Mark Amstutz and refused to leave, despite multiple warnings, Smith said last month. The protesters say divestment is a moral issue, viewing it as a way to combat climate change. They claim administrators are hiding behind guidelines that call for the school to make investments based on the best long-term financial results, not social objectives. "It's about stigmatizing the fossil fuels industry and also taking a moral stance," Marchese said.